Putting the ‘Protest’ back in Protestant! On the evening of Friday, May 19, three Proclaimers (Rev. Caleb Crainer, Kristian Kohler, and Rev. 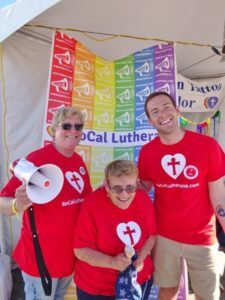 Asher O’Callaghan) descended upon Long Beach, CA to set up the SoCal Lutherans booth for Long Beach Pride. 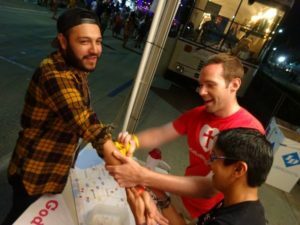 As the Southern California Chapter of ReconcilingWorks, SoCal Lutherans maintains an annual presence at Long Beach, Los Angeles, Orange County, and Ventura County Prides. We distribute buttons, pens, and most famously, temporary tattoos. The theme we chose for our festival and parade presence this year is “Putting the ‘Protest’ Back in Protestant.” After the weekend ended, I found myself wondering what exactly it was that our presence was protesting and proclaiming. The message of God’s love for all— especially for LGBTQ+ people—is itself a protest, I think. Our protest is one of words: that God loves you and the ones you love, no matter what those who would try to use religion as a weapon of hate say. Our protest is also one of deed: putting temporary tattoos on bodies that have been told by others that they don’t count, don’t belong, or don’t matter to God. And our protest is one of heart (rainbow hearts, to be exact): witnessing to the incarnate Love of God. As Pride season begins, we have many opportunities to offer public witness, to be our true selves and invite others to be their true selves. We can boldly proclaim that God loves all, and in so doing protest exclusion, injustice, hatred, and violence. We can literally and figuratively cover the world in rainbow hearts. K.C. 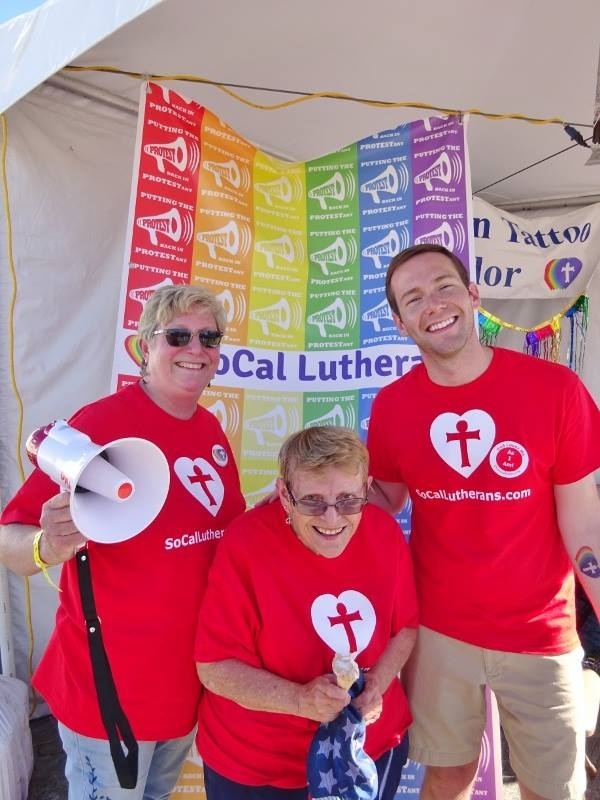 Kohler (pictured on the right with Sandy Smith (center) and Ruth Benner (left)) lives in Venice, CA, and is on internship at St. Paul’s Lutheran Church of Santa Monica / SoCal Lutherans (the Southern California Chapter of ReconcilingWorks). In August, Kristian will return to Reading, PA to await Fall Assignment. He is recently obsessed with a Netflix documentary series on castles starring the historian Dan Jones. This entry was posted on Thursday, June 1st, 2017 at 5:00 am	and is filed under Blog. You can follow any responses to this entry through the RSS 2.0 feed. Both comments and pings are currently closed.